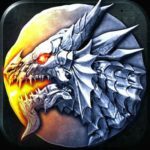 Castle Kingdom is a fantasy strategy game from Sevenga an the main selling point here is the fact you’ll be facing real-life players from all around the world – as an MMORTS/base management game in a similar vein to Clash of Clans and Boom Beach, the social element of this game is very, very important. 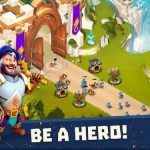 Like in other games, you can recruit legendary heroes from various elements, set up your defenses, recruit armies representing different factions in the fantasy universe, cast spells, and most of all, test your strategies against those of players from around the world. For a lot of players, the MMORTS genre needs no introduction whatsoever. And while the “real players” selling point is a very common one in the genre, it isn’t exactly a case of “played one, played them all.” So having said that, let’s cut to the chase and present to you our exclusive Castle Kingdom strategy guide. You’re going to need it whether you’re new to the genre, or simply new to the game, period. You want to complete as many quests as possible in this game, as that will be the best way to stock up on diamonds. This can be done by finishing various types of quests; the dailies, the ten “regular” quests, and any one of the Achievement quests. Whenever possible, check the game so you can see which quests you can work on next. Bear in mind that you will be required to redeem your rewards manually; it’s an inconvenience, but a minor one, nonetheless. 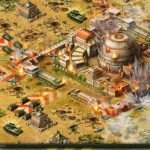 It’s important to make every move count when heading toward an enemy base, and make sure your troops are positioned smartly. Although it may often seem that way, enemy bases aren’t as impenetrable as one may think, and you won’t always have to take in a ton of damage. It all boils down to planning your route smartly and positioning everyone in your army properly. When making your way to the base and preparing to attack, avoid those defense towers, and attack those towers that don’t have any defenses so you can stack up on mana. In-game artificial intelligence doesn’t play much of a role here, as your main opponents are real players, and not just simplistic computer-controlled bases and armies. But the squad AI in this game tends to leave a lot to be desired, and your troops might not always go where you want them to. Should your troops veer off to another path, use flares to guide them back to the right direction and prevent them from getting killed just because they went the wrong way. 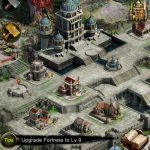 There are many good ways for you to design your base, but the common theme here is that you have to pack your buildings together, not too tightly, but in such a way that your base takes up only one part of the map. Don’t follow the example of those AI-controlled enemy bases, where the buildings are fairly far apart from each other. The trick here is to draw your enemies into your defensive towers, and to surround your defensive towers with your most important buildings. Your equipment is divided into different rows on the equipment screen, with each row corresponding to a specific set of items. These sets provide buffs for your heroes, starting with the Life set on top, which boosts a hero’s maximum health rating. That’s just one of the examples of the buffs these sets can give you, so complete those sets and get those bonuses. As long as it’s possible, don’t equip items from various sets, as that’s going to dull the potential effect quite a bit. There are different types of currency in the game, and the red magicstone currency is used to upgrade individual pieces of equipment and improve their stats. As long as you’ve got enough of this currency, keep upgrading those items and make your heroes stronger overall. And if you’re worried about not having any magicstones to spend in the future, you can get them back once you sell pieces of equipment. And you won’t just be getting a fraction of the magicstones you used on upgrades, but all of them. That’s a nice perk, and one that allows you to spend more freely on rarer and stronger items, instead of saving up long and hard for those pieces. It would all depend on the type of heroes you currently have. If you’re starting out and you’re stuck with the common starter heroes, you can use Blizzard, Meteor, and other basic spells. Move on to the more advanced ones once you’ve got powerful and/or rarer heroes on your team. And power up your heroes’ special skills with your starting spell; the game doesn’t explain what it does, but its power is immediately charging the special meter, allowing your heroes to unleash their special skill right away. For now, these would be our tips, tricks and hints for Castle Kingdom. If you know other tips for Sevenga’s immersive mobile game, let us know below in the comment section!